A great many industrious cinephiles live in Los Angeles. It's no mistake, for instance, that those rock-and-roll auteur shirts you see around come from there. In fact, I write you from that very town, to which I moved for a variety of reasons related to my film habit. 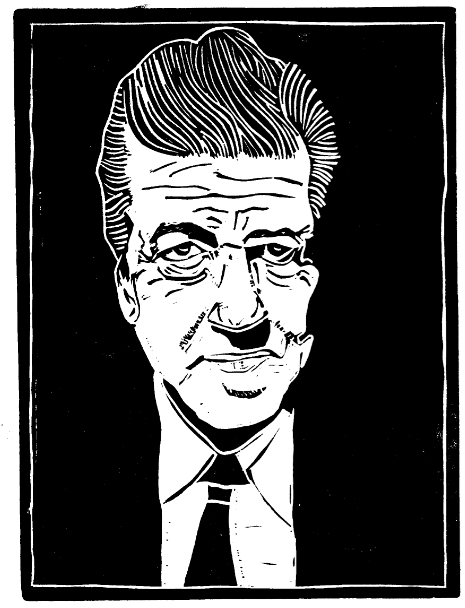 While I may not count myself as particularly industrious, I do count myself as a cinephile, and I can thus appreciate a project of genuine film-loving industry like Loren Kantor's classic movie woodcuts and linocuts. Taking Hollywood and its fringes as inspiration, Kantor creates striking, high-contrast black-and-white images that bring icons of contemporary culture into a far older aesthetic realm. And who counts as more of an icon of contemporary culture — at least, I sense, in the minds of most Open Culture readers — than David Lynch? Kantor's woodcut, seen above, captures the air of simultaneous unflagging wholesomeness and infinite darkness that swirls about the director and his films. Or perhaps you consider Steve Buscemi more relevant to our times; in that case, Kantor has created a woodcut of him as well, one that evokes the actor's alternating layers of worn-down malaise and peculiar alertness. 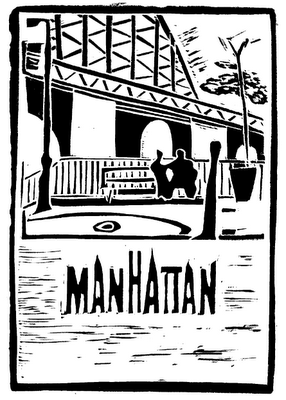 Just above, you'll see Kantor going in a different direction with a rendition of the poster for Manhattan, one of Woody Allen's most beloved New York pictures. "I fell in love with woodcuts in the 80's when I attended a German Expressionist art show at LA County Museum," Kantor tells Open Culture. "The stark lines and brusque images reminded me of film noir classics." Should you ever find yourself in Los Angeles with time to take in a movie screening at the Los Angeles County Museum of Art, pay a visit downstairs, to the floor below the theater. There, throughout the hallway, the museum displays the posters for all its German Expressionist art shows — including the one that inspired these woodcuts in the first place. To view more of Kantor's work, visit Wood Cutting Fool: Journey of a Carving Enthusiast or this recent spread on BrainPickings.